Inmate survival information for those who may be incarcerated or about to be incarcerated. If you are going to jail or prison you really need to read this jail guide. Did you just got arrested? Have you been indicted? Do you have an active warrant? Or did your friend, family member or other loved one just go to jail and you are worried about what is going on right now... or even what the process is? Like most people that may have to survive in prison and don't know what to do or what to expect and need answers about what is going on and what is going to happen next. Whether a white collar crime, blue collar crime or even no collar crime, if you believe you are going to prison or jail then you really need to take into account what will be happening to you in the next few days, weeks or months as this will be the most traumatic thing your mind and body will ever experience. From being arrested, to finding the right bail bondsmen, to using and paying for the right defense attorney and finally, if you have to go to prison or jail, how to survive in prison, its all in my newly updated 144 page manual. 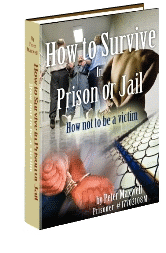 Best of all, "How To Survive Prison" is an instant download digital book - it will not be mailed or shipped - you get this book as soon as payment is made. Get the information you need to know... Right NOW! Know what and who to look out for... and, most importantly, understanding "why"
Why you should always say no to drugs, gambling and gangs... and how to do it without confrontation. Can you recall being the new kid in school? Everyone watching you. Staring at you? It's different being the new inmate in prison, especially if you have never been locked up before. You pull up to the prison and the bus rumbles through the gate and into the intake section - often surrounded by more fencing. Like military bootcamp, you jump off the bus to a lot of screaming and yelling being directed by very angry looking individuals and having onlookers laughing and jeering. As you are herded off of the transport bus, leg irons barring you from taking wide steps; listening to cat calls, whistling, screams of angry men yelling how they are going to kill you, or ask why you're crying... only to be searched again before you are assigned to a cell and a new "roommate".